Home » HA Kidd » H.A. Kidd sewing notions » Applique or quilting, which comes first? Those big white squares around the lone star need to be filled in – too stark and blank for me and there isn’t enough of the dark grey fabric in the quilt. I’ll use it for the binding and applique to tie it to the stripes in the star. So the question is applique or quilting, which comes first? Well, there are two answers to this question and neither is wrong. It all depends on personal preference of how you want to finish off the quilt, what you want the back to look like and how many threads you want to tie off and bury when all is said and done. If I go with putting the applique on the quilt top now then I’ll have to quilt around the snowflakes which will be tedious and more time consuming with all the starting and stopping I’ll have to do. 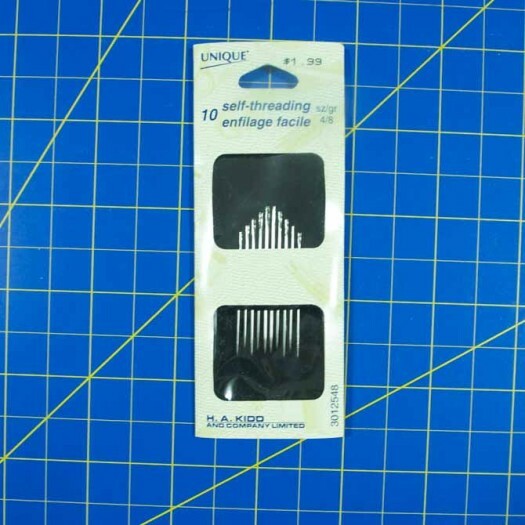 Plus I’ll get lots of use out of my self-threading needles when I’m tying off and burying all the loose thread ends. 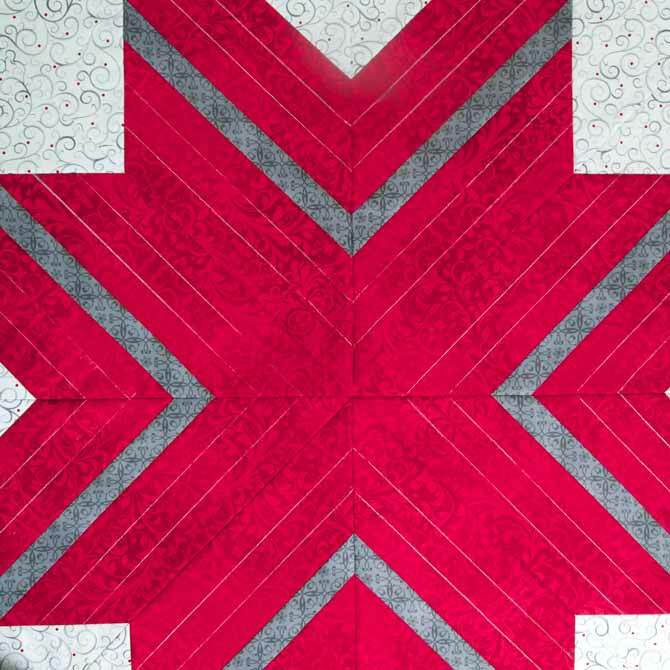 If I quilt it first then I can just add the applique, stitch around the snowflakes and be done. To create the snowflakes I used the HeatnBond EZ Print sheets in featherlite weight. 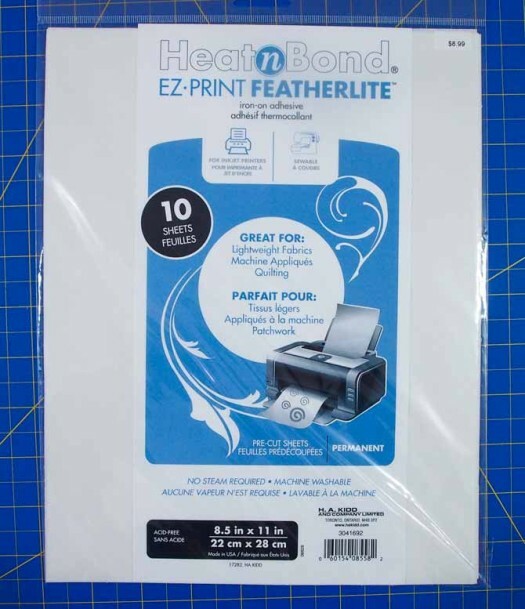 These 8½″ x 11″ pre-cut sheets are for ink jet printers only. 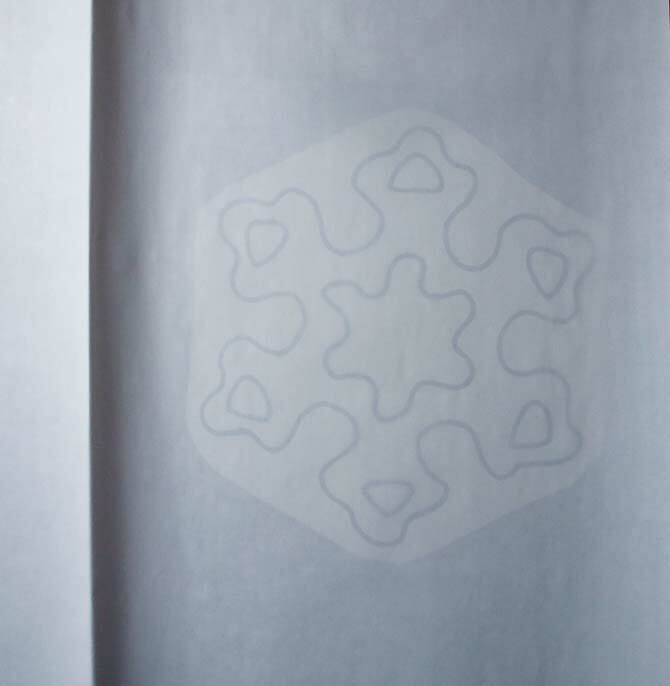 And since my snowflake motif was a file in my computer it was easy as 1-2-3 to print off the template onto the fusible web sheets. Just remember to place the fusible side up in the printer tray so that it prints out on the paper side. Once printed on the fusible sheet I waited for the ink to dry and sometimes it does smudge a bit but that’s no problem since the paper is going to be peeled away. After cutting out the design I fused the snowflake to the wrong side of the dark grey fabric. I used a pressing paper from HeatnBond to cover the applique and fabric so as not to get any glue on my iron surface. They are pretty much see through making it easy to see the applique shapes and fabric. Using presser paper is a very good habit to get into because trust me you do not want a sticky, gooey mess on your iron. These presser sheets are 11″ x 17″ in size and are reusable but once the shiny side starts to disappear it is time to throw them away and get a new one. Here are the snowflakes in place on the quilt – only pinned in place so I can see what they look like because I’m going to quilt the piece before I add the applique. 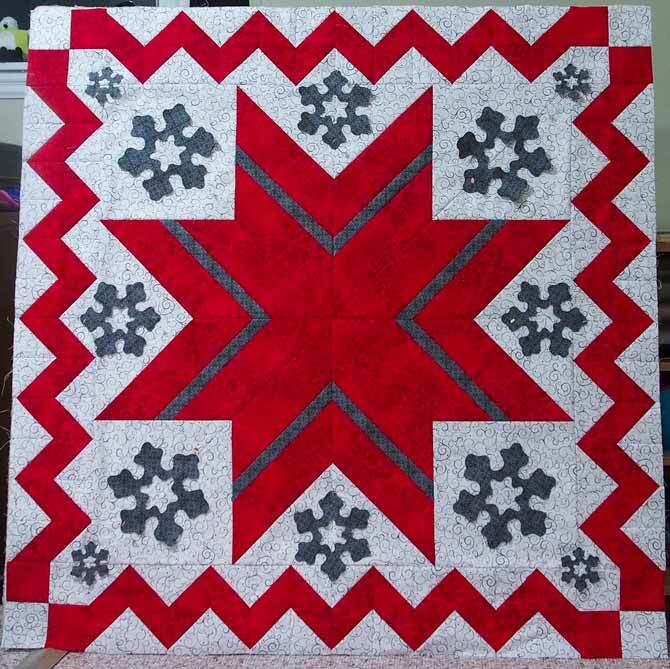 I wanted to put some black snowflakes on the quilt as well but I was told they were to dark in more ways than one. I will stick with dark grey snowflakes but in 3 different sizes. I don’t want to have to bury a lot of threads when I’m done so I’m going to quilt the piece before I put the applique on. This means that I will have the applique stitching on the back of the quilt but because I’ll be doing a satin stitch it will look really cool to have the snowflake motif outlines with stitching on the back of the tree skirt. Using the right marking tool for the job is very important as we do not want any of the marking lines to show up after the quilting is done. 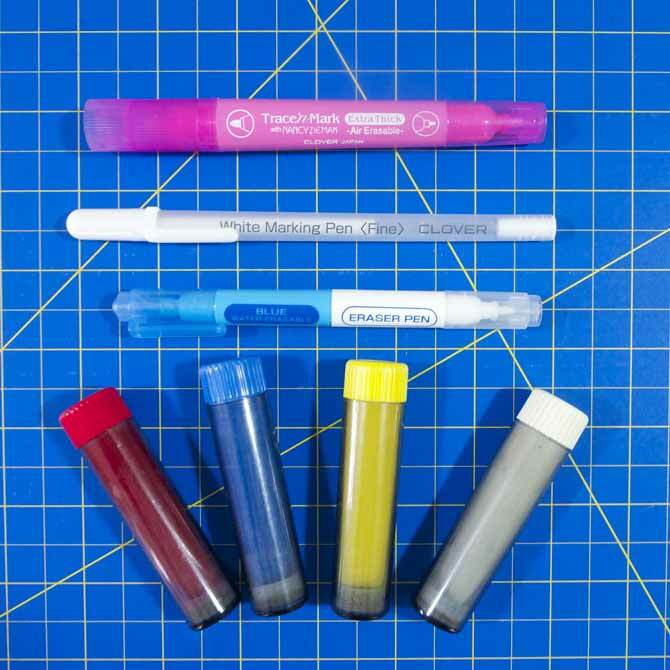 There are many marking tools out there – here are some that are in my drawer. Before I baste the layers I figured I would mark on some of the quilting lines in the star so that the pins wouldn’t be in my way. I used the white chaco liner from Clover for these lines on the red fabric but I’m going to have to use something else on the white as I don’t want the red, blue or yellow chalk to leave a mark on the white fabric. Although I did discover yesterday that a fabric eraser will remove the chalk from most fabrics but I would still be wary with light fabrics. The blue eraser pen does work and erases off completely. I did a test piece. Always do a test piece on a scrap of your fabric when using a marking pen because you want to make sure it will come off and leave no marks – especially on light colored fabrics. I’ll wait and mark these when I’m ready to quilt these sections. Once I had the marking lines all sorted I basted the layers with curved safety pins leaving about a fist width between the pins. Yes, it’s a lot of pins but well worth the effort because it won’t move and there won’t be any ripples, buckles or puckers when I’m done. I’ve used a 100% cotton batting for this piece as I don’t want it to have a lot of loft. I don’t have a lot of choice for threads for this piece. I can do either red, white, gray or silver/gray and it can be either cotton or rayon. Shiny versus mat finish. 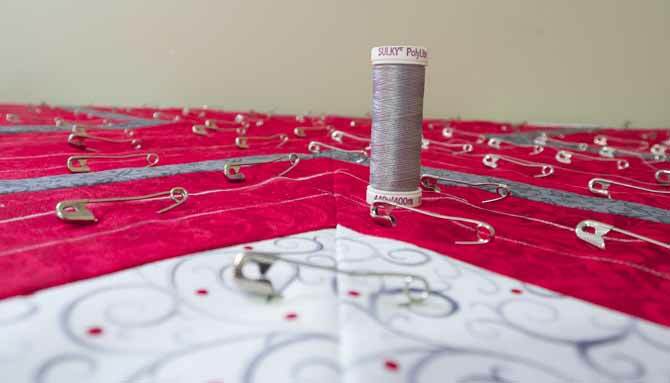 The Sulky rayon thread provides a wonderful shine when stitched into the quilt and with it being a 30 weight thread it stands out nicely but I think that the red will blend in too much with the red fabric and not really show up. The 2 different variegated gray/black cottons of the Sulky blendables I think will give really nice contrast to the piece and stand out nicely since it’s a 30 weight thread as well. The darker one on the red fabric and the lighter one for the white background. I’ll use the Sulky rayon silvery-gray to stitch around the snowflakes. It’ll be nice contrast to the dark gray fabric. 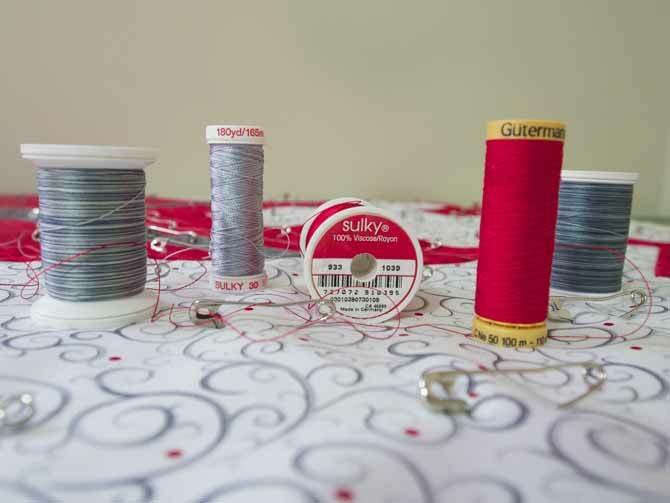 If I wanted to do any stitch-in-the-ditch quilting then I would use the Sulky Polylite as it’s a finer thread (60 weight) and will sit in the ditch much nicer than the 30 weight thread. This isn’t my favorite quilting stitch as I find it tricky to do perfectly and if it isn’t done perfectly it just doesn’t look nice in my opinion. I figure if you’re going to go to the trouble of quilting then why not show off the stitching and all the work you have done. In the bobbin I will use a gray Gutermann 50 weight cotton. Now that I made my thread choices I can get started on the quilting and then move onto the applique and finish with the binding. Once the quilting is done I’ll slit the piece open from a corner to the center and make a circle in the center with the Tru-Cut circle maker. I’m not going to apply any ties to the tree skirt but rather I’m going to put buttons on the back with some fabric button hooks sewn into the binding to attach around the buttons and keep the tree skirt together. The Dress It Up buttons I plan on using are penguins – oh so cute and my nephew’s wife is a penguin fanatic. The tree skirt is done and looks awesome dressing up my friend’s tree in this inviting room with a fire to sit by while reading a good book or just sitting and relaxing. So as you can see there is no wrong answer to the question applique or quilting, which comes first? 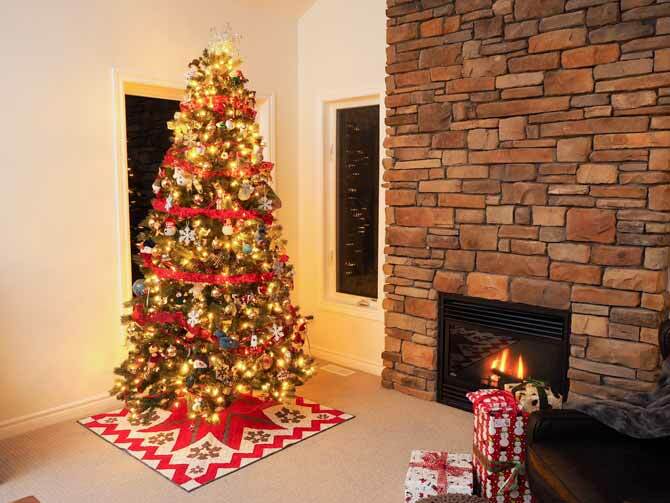 I really love the tree skirt! Did you have any issues with bulk when you did the satin stitch on the snow flakes through all the layers? Hi love your tree skirt ! Thanks for all your hints and inspiration and a neat giveaway! Enjoyed the blog post on Applique or quilting, which comes first? The tree skirt look gorgeous! Thanks for sharing.